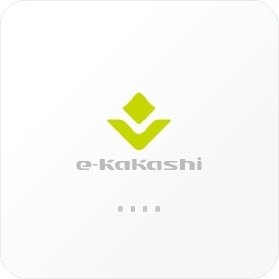 What are the gateway and sensor node of the cultivation navigator "e-kakashi"? We will contribute the following merits to producers and other stakeholders, by formalizing the tacit knowledge that was, until now, formatting the tacit knowledge that, until now, relied on experience and intuition. This is what is amazing about the gateway & sensor node! Since the gateway and sensor node manage all data and applications in the cloud, there is no need to setup and maintain your own server. Also, in the event of a natural disaster, even if the gateway, sensor node and sensor set in the field are damaged, the accumulated data will not be affected. Data is automatically stored even on the gateway side, so even if there is an abnormality in the communication line, data can be recovered for up to one month. Since everything is in the cloud, you can access cloud data from anywhere and get the latest information all the time. Also, you can access it from your smartphone or tablet, so you can check data while outside and on the field. The state of the field is also automatically monitored 24 hours a day, 365 days a year, and all the data is stored. 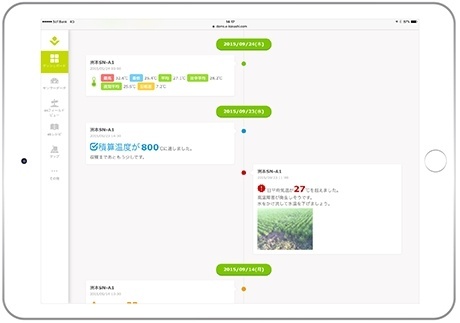 By inputting the proper “cultivation management work”, based on "knowledge" that up until now relied on experience and intuition, into “ek recipe”, the route, it will display alerts regarding pests that could not be seen by eye and work instructions. By formalizing the cultivation technology that used to be tacit knowledge, we open the road towards a new era of agricultural production. 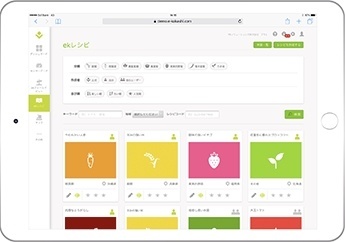 In the application, the graph function is most popular among professional producers and cultivation leaders. 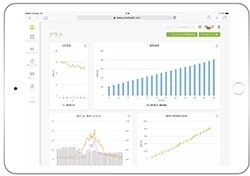 You can freely select the vertical axis, the horizontal axis, and the graph type, and create a unique graph from calculated data such as saturation, dew point temperature, integrated temperature, as well as measured data (raw data). 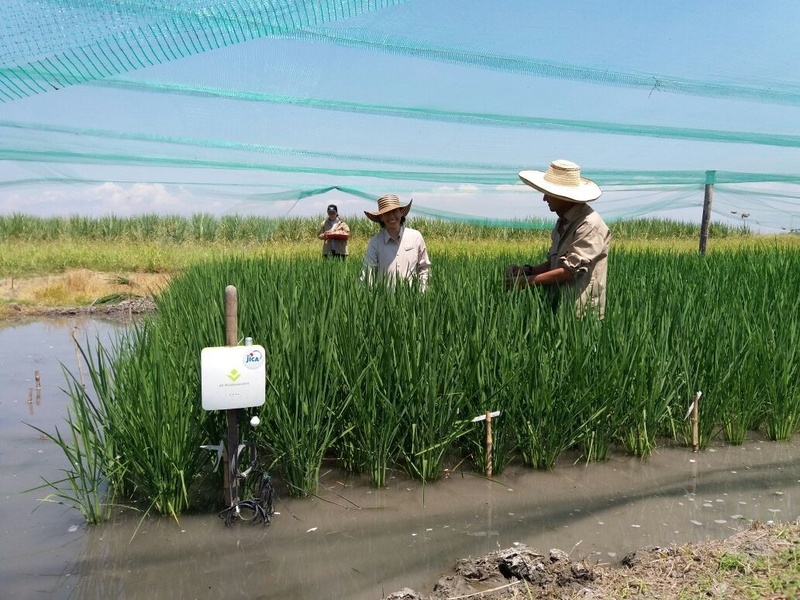 By feeding back the target values and threshold values obtained by the analysis to "ek recipe", it becomes possible to be navigated through cultivation with an even more precise route. 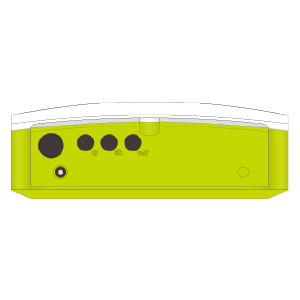 It operates more stably by connecting to the internet outdoors. We solved this problem, which may look easy but is not, by renewing the design from every possible perspective. With a built-in mobile phone module, we achieved a stable remote monitoring of the equipment from the cloud while outside, with both data transmission and reception. 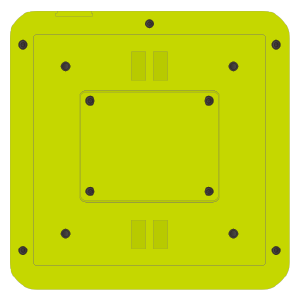 A stable and highly secure wireless communication with the sensor node is also achieved. We will fulfill that mission. 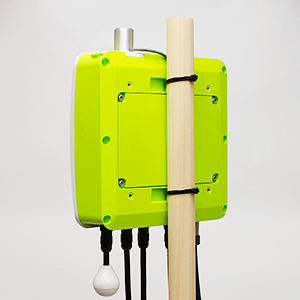 The new sensor node is designed to fit the needs of every cultivation site. Far, far ahead with the antenna diversity. The power saving specifications allow for three years of battery operation. 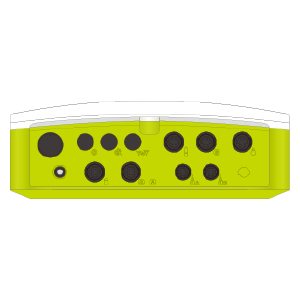 The sensor interface allows for scalability without any unnecessary function. It can be comfortably setup even on piles, walls, and beams, thanks to the carefully thought out design. *AC power supply needed for the optional sensors. * The actual value depends on usage conditions. 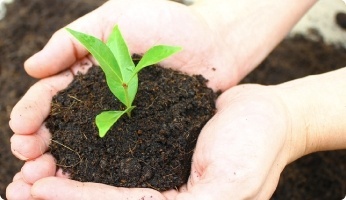 Why is an IT company and not an agricultural or chemical company being tasked to solve food problems in Colombia? 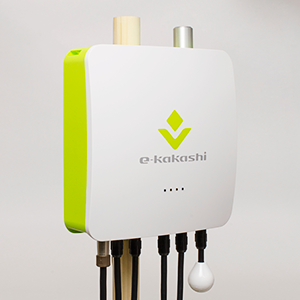 The answer is e-kakashi, a powerful IoT tool designed by PS Solutions. tions. 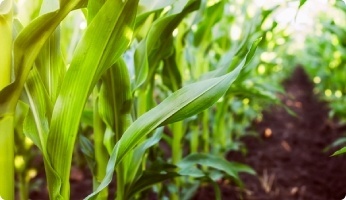 e-kakashi collects environmental data and integrates it with farming data to give crop growers the best solutions to a wide range of field conditions.